States vary widely on the number of charges filed. California had the highest number of charges filed with 1,211 total charges between 2012 and 2016. Several states had very few charges filed, less than 40 over the five year period filed. Due to data confidentiality, we do not report the total number of charges for states that had less than 40 filed during our time period. 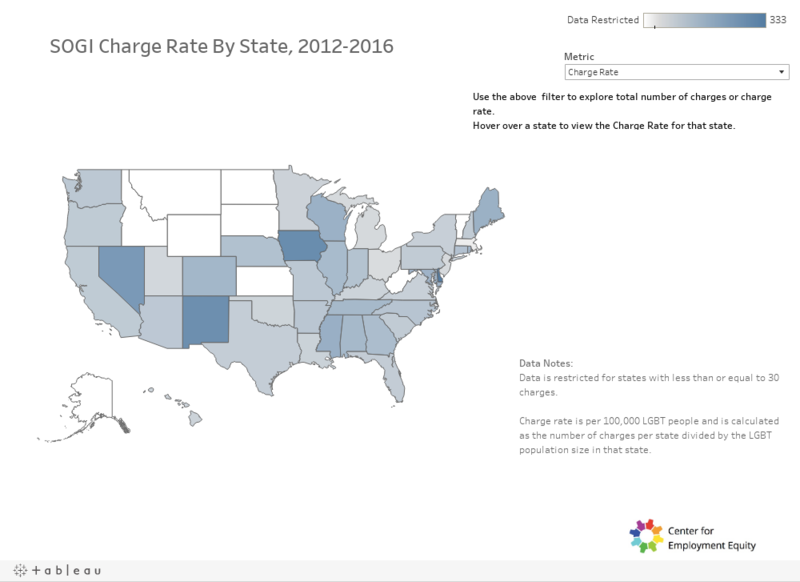 Of course, states with more LGBT people are likely to have more charges of discrimination, but the overall charge numbers reported do not take into account the LGBT population size. Therefore, we calculate a rate of SOGI charges per 100,000 LGBT people, drawing from population estimates reported by Gallup. The charge rates varied from a low of 19 charges per 100,000 LGBT population in Massachusetts to a high of 333 per 100,000 LGBT population in Delaware. Please see our full report for a discussion of the methodology in calculating the LGBT population adjusted charge rates. Subscribe to receive the latest CEE research reports, news, and other updates.